Creating palatable, presentable and biologically stable wines have been a critical goal of the wine making process for many centuries and sometimes the artistic creativity of the winemaker to find clever solutions to prevent wines from spoiling during long voyages have inadvertently produced great wines like the fortified Port and Madeira in Portugal and Sherry in Spain. In this article we will explore the need for wine clarification and stabilization and the different methods used including old and new techniques for creating wines that are presentable and importantly palatable. Wine derives its general characteristics and flavor composition from a complex set of chemical processes primarily involving grapes and yeast which converts the juice to wine and additionally from the wood used in aging the wine. These chemical processes during the wine-making process create insoluble matter which include grape particles and fragments, microbes, yeast, tartrates, protein molecules and other compounds. In wine-making, clarification and stabilization are processes done before bottling that remove insoluble matter which can affect the clarity, flavor, chemical and biological stability of the wine. A wine is considered clear if there are no visible particles suspended in it, and considered stable if there are no undesired microbes and yeast particles that can alter its flavor in an undesirable way. 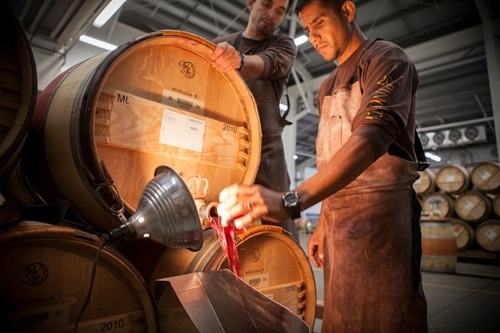 In addition to being clear, wines must also be made stable before they are bottled. 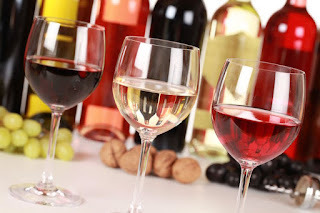 There are different methods used for the clarification and stabilization of wines depending on the type of wine as both red and white wines have different characteristics. Wine clarification process ensures that a wine is clear by removing any suspended matter which will cause the wine to appear cloudy and dull. After fermentation, wine undergoes natural clarification as a result of gravity which causes the leftover yeast particles from fermentation and the grape particles like seeds called lees, to settle at the bottom of the storage vessel. The wine is then siphoned or 'racked' into a new container leaving behind the lees. Racking allows clarification and also aids in the stabilization of the wine by getting rid of the leftover yeast particles which can alter the taste of the wine if there is prolonged contact with it. The racking process is repeated several times during the aging of the wine as the lees or sediments are continuously separated from the wine. Racking is more effective for red wines due to its tannin which acts as a fining agent. Some commonly used clarification methods during the wine-making process are fining, filtration and flotation. 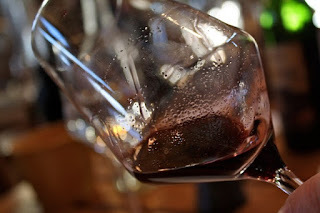 Fining is the process where a substance called 'fining agent' is added to the wine to remove suspended particles and other complex substances such as polymerized tannins, phenols and proteins which impact the bitterness, astringency and color of wine. 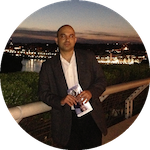 Some fining agents attach to the unwanted particles, and the larger particles then settle faster while others neutralize the electric charge on the unwanted particles, causing them to settle quicker. Though many different substances have historically being used as fining agents, the two general types of fining agents commonly used today are organic compounds and solid/mineral materials. The most common organic compounds used are egg whites, casein derived from milk, gelatin and isinglass obtained from the bladders of fish, while bentonite clay is the most common mineral material used. If the winery equipment uses metals, a process known as blue fining is sometimes used to remove any copper and iron particles that have entered the wine, using potassium ferrocyanide. Egg whites are one of the oldest techniques used in fining and also very effective. In this method the egg-whites separated from the egg-yokes are mixed in a salt solution and then stirred in the wine, which binds to the tiny particles sinking them to the bottom of the vessel. It is also used in high tannic wines, to soften the wine's astringency by binding and reducing the tannin content. This method has a long tradition of use, especially in the Bordeaux, where it is used to to tame strong tannins, reduce astringency and give the wine a smoother mouthfeel. Fining can also impact the aromas and flavors of the wine depending on the type and quantity of fining agent used, so the process must be done with care. Filtration works by passing the wine through a filter which removes unwanted particles that are bigger than the filtering medium. Filtration can be broadly classified as either coarser depth filtration or finer surface filtration and each method is used depending on the particles to remove and their size. Depth filtration is accomplished using diatomaceous earth or pads made from cellulose material. Diatomaceous earth is a naturally occurring, soft, silica sedimentary rock which is ground into various particle sizes. The smaller the particle sizes, the smaller the particles it filters out of the wine. In the case of pads, the thicker the pads, the finer the particles trapped within the cellulose material. Depth filtration can easily remove course particles from a wine at a relatively inexpensive cost but is not effective for removing finer particles from the wine. In surface filtration, the wine passes through a thin membrane where the pores are smaller than the particles being filtered. As the name implies, the particles are collected on the surface of the filtering membrane while the wine passes through to the other side. Ultra filtration which is the finest surface filtration, can remove very fine particles including yeasts and bacteria. It can also remove important flavor components including tannins, pigments and proteins which specifically impact the characteristics of red wine as it can lighten the color and body of the wine. This filtration method may be appropriate for white whites, rosés and younger lighter red wines, but many wineries producing top quality wine tend to frown on this method. Filtration process can also expose the wine to oxygen which can have a detrimental effect on the wine if not managed properly. Flotation is a process where the grape solids are collected into a mass by the action of gas bubbles injected into the bottom of the wine tank and forced to rise to the surface. Flotation is primarily used in the production of white and rosé wines. The primary advantage of this method is the increased speed of separation of the solids compared to the traditional racking method. Nitrogen is considered the most effective gas for flotation as it forms good size bubbles, is of low solubility and has no side effects but can be relatively expensive. This technique has been adapted from the mining industry where it is used for ore refining. Wine is a complex chemical mixture made up of many active microorganisms which can react to changes in its environment making the wine unstable. The major sources of instability are the residual sugar, live yeast cells which can cause re-fermentation, bacteria which can turn the wine rancid and tartaric acid which can cause tartrate crystals. Most of these issues are addressed by proper wine-making techniques that ensures both alcoholic and malolactic fermentation have run to completion, strict hygiene, using wine racking and clarification methods which ensures the removal of any unwanted particles, yeast and bacteria. Some of the common methods used for wine stabilization are addition of sulfur dioxide, mixing alcoholic spirit, hot and cold stabilization. Sulfur dioxide acts as an antimicrobial and antiseptic agent and is one of the most efficient additives used to help stabilize wine through its duration. Sulfur dioxide also acts as an antioxidant by inhibiting oxidation besides acting as antimicrobial agent that eliminates the influence of any yeast and bacteria. The negative effect of using sulfur dioxide is that excessive doses have a negative impact on aromas and flavors of the wine, besides most consumers prefer to acquire 'naturally' produced wine without the use of 'unnatural' additives. This is a technique used in sweet fortified wines like Port and Sherry as the alcohol kills all yeast and bacteria. 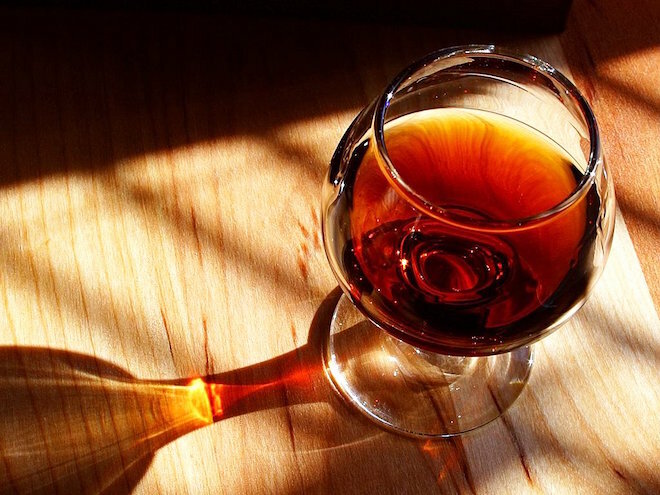 Early exporters of Port wines realized that adding a little brandy enabled the wines to survive long journeys as it helped stabilize the wine. Port was therefore born from a need to stabilize the wine during longer voyages. Hot stabilization is used to remove the excess protein in the wine, specifically for white wines. This is done by using bentonite. Grapes contain small quantities of protein which are introduced into the wine during the fermentation process. This can cause the wine to be hazy at higher temperatures as the protein molecules bind to each other creating larger particles. Red wines which contain phenolic compounds due to their longer maceration period are less affected by these proteins, while white wines and rosés need to be treated if they contain excess protein. 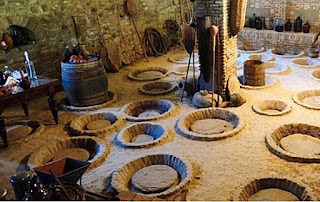 Bentonite added to wine can bind to the proteins and also to the desirable aroma compounds, hence larger quantities of bentonite will tend to have an adverse effect on the aromas of the final wine. Cold stabilization is used to remove tartaric acid from the wine, which is known to cause tartrate crystals, that look like broken glass, though otherwise harmless. The process involves reducing the temperature of the wine to nearly its freezing point to purposefully create tartrate crystals which can then be removed from the wine by racking or filtering. Tartaric acid is a naturally occurring acid found in grapes and on exposure to low temperature it can crystallize unpredictably. Tartrate crystals can form in red wines just as they do in white wines but they are more noticeable for white wines, as they are chilled before serving, and in addition, the dark color of red wine obscures tartrate crystals. There are many wine producers and consumers who believe that the production of wine must be a natural process without the addition of chemical additives. There are some ancient techniques that produce wine without the addition of chemical additives, like the use of an ancient clay vessel called qvevri in Georgia. The shape of the qvevri plays an important factor during the fermentation and maceration phase as any prolonged contact of the wine with the lees is minimized due to the pointed cone-shaped bottom of the qvevri. Lees which are the leftover yeast particles from fermentation and the grape seeds settle at the bottom of the qvevri leaving the grape skins floating at the top allowing extended contact of the wine with the skin extracting a maximum of substances that are healthy and flavorful. The completion of fermentation also coincides with the falling of ambient temperatures and the onset of colder weather, thus favorably influencing wine clarification and removal of tartrates which are tartaric acid crystals formed during fermentation. Silicon which is a high quality crystal present in the qvevri walls also acts as an agent in the removal of tartrates. This natural filtration process taking part in the qvevri leads to the formation of crystal-clear wines. Wines made using the qvevri are considered to be naturally stable and do not require the addition of any chemical agents for stabilization and clarity. Many winemakers have a strong philosophy for producing wine using natural methods or with very little use of chemical clarification and stabilization additives. This requires time, care, hygiene and proper wine making techniques that ensure that a wine's aroma, flavor, texture, color or aging potential is not diminished through clarification and stabilization processes.